Even though January is well underway already, I’m sure it’s not too late to wish you – and very sincerely so – all the best for a happy, wonderful, love-filled, healthy, and of course creative 2018! 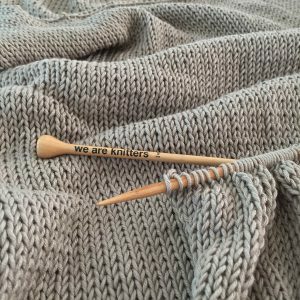 I’ve seen quite a few people picking a word for the new year – “focus” would be a good one for me, but “catching up” is the first one I need to focus on 😉 so … in order to do this, let’s kick my new blogging year off with the long overdue post on my WAK-knitting adventure! 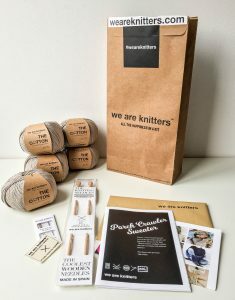 I love it when I get asked to cooperate with companies that like anything that has to do with yarn as much as I do. 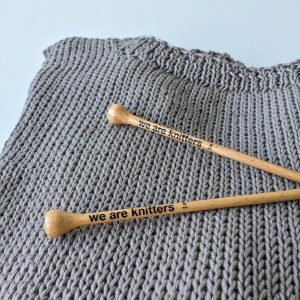 And when they’re the hip, trendy, sustainable-loving people that I think “We Are Knitters” are, it makes things even better. 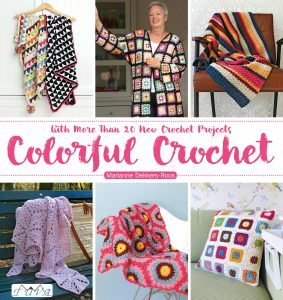 “WAK” offers both crochet and knitting kits, but me wanting to improve my knitting skills, “We Are Knitters”, Quinn, and I stroke a deal: Quinn would pick one of WAK’s beautiful (and often different, I SO like that) knitting designs, choose the colors offered for that particular project, I would knit it, and when it would be ready Quinn would model the project. It turned out to be a super pact! 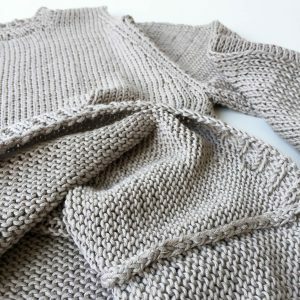 Quinn opted for a sweater, and actually had a hard time deciding; she loved both the “Silver Monk Sweater” and the “Porch Crawler Sweater”. 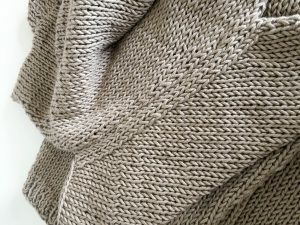 After quite some deliberating, she singled out the “Porch Crawler Sweater”, as well as the color: “Pearl” (7157), which turned out to be a beautiful grey-beige. 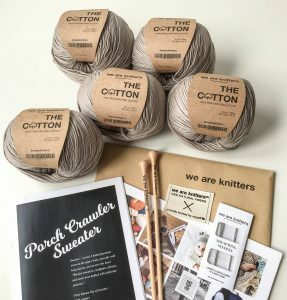 Right before our summer vacation in France, the gorgeous kit arrived, and it was one of the 4 projects I decided to take with me. I know … 4 projects for a 2-week vacation may seem a bit ambitious, but as with books, I have a hard time deciding “what will I feel like reading/crafting” when I’m away from home. 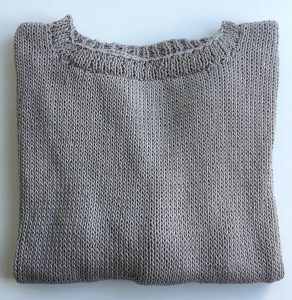 As it turned out I was not too-too ambitious, since project 1 (the ever so wonderful “Hotel of Bees”-shawl by Christina / A Spoonful of Yarn – more on that soon) only took me 2 days of almost full-time crocheting to finish, after which it was project 2’s turn: Quinn’s sweater. 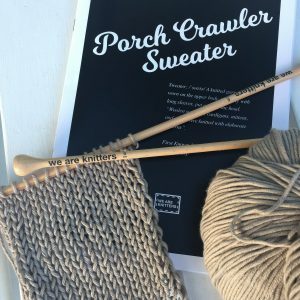 Knitting the “Porch Crawler” was such a pleasurable ride! 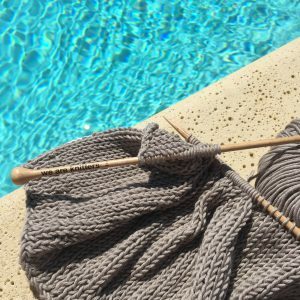 The 100% Peruvian Pima Cotton was the softest and most delightful cotton to work with, and the bigger part of the pattern was pleasant and easy – mindful even – knitting, done alongside the pool, while listening to an audiobook. 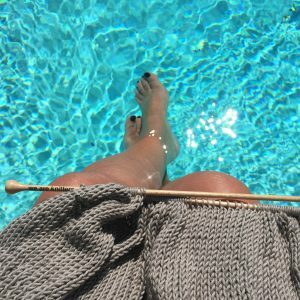 A first for me, and the best of both worlds, I think: crafting ánd “reading” at the same time, pure bliss. 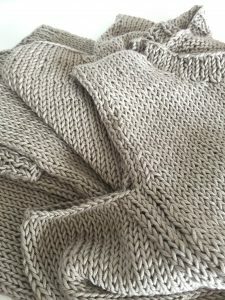 I zoomed through the pattern, and the sweater would have been ready a whole lot sooner if I had not broken my arm right after our trip to France… Oh well – as soon as the doctor told me I could slowly start using my arm again, I got back to it. 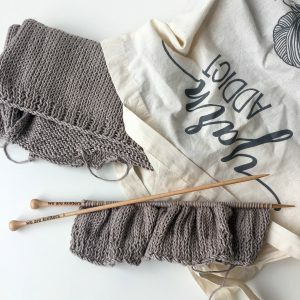 You see, I’m a left-handed person all out, but there are two things I do right-handedly: knitting and using the mouse while doing computer work. 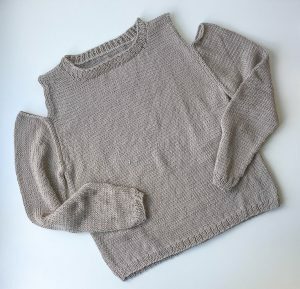 So with my left arm still in a brace, I began working on the sleeves – thrilled to be able to be creative again. 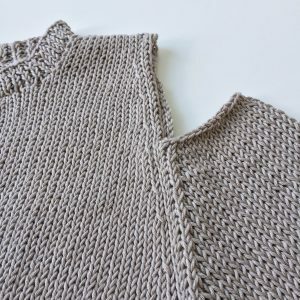 When sewing all parts together, I first used a regular whip stitch (as you can see on the right in the photo above), but did not really like the look of these seams. 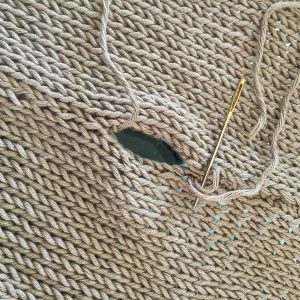 A quick Google search brought me to this excellent Purl Soho-tutorial for the so called “mattress stitch”, and wow, what an improvement (left side of the seam in the photo above). 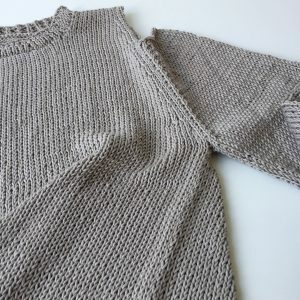 I now love how my seams look, especially where I’ve joined the sleeves, and even the wrong side of my seams look great! 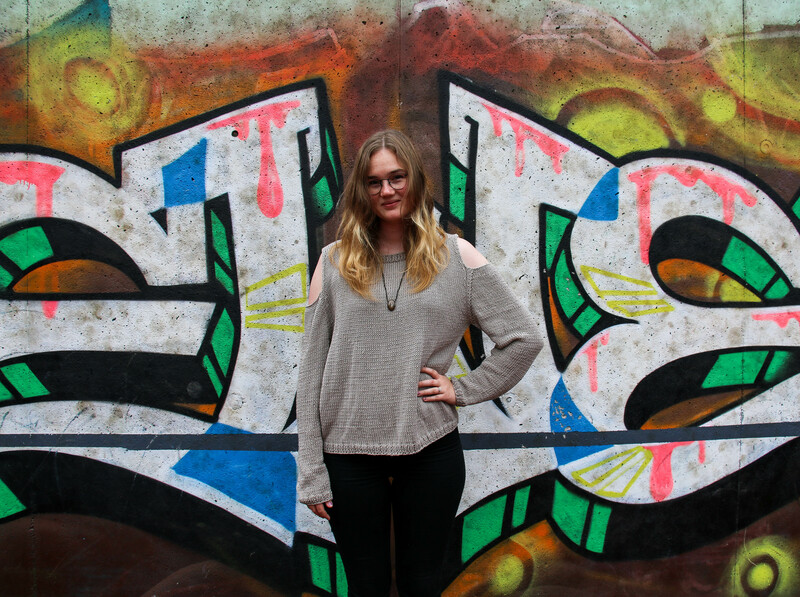 It was fun to finish the sweater right before Quinn’s 21st birthday – even more so since she did not expect it to be done (due to my broken arm). More fun to learn she loved it (phew! ), and wears it with noticeable pleasure (always such a nice reward for the maker…). Oh sweetheart, how fantastic is this! I love the jumper and of course Quinn looks absolutely gorgeous wearing it. 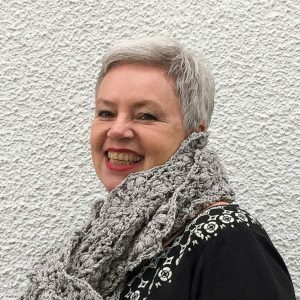 I am so chuffed that you are becoming more of a knitter with every project you tackle, I wonder what is next? 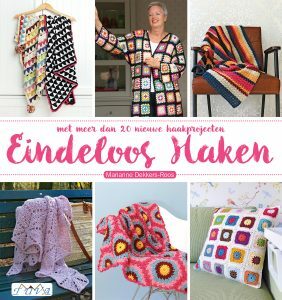 Dankjewel, Esther! 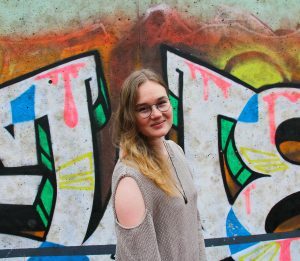 Ja, breien is óók fijn om te doen, hé? 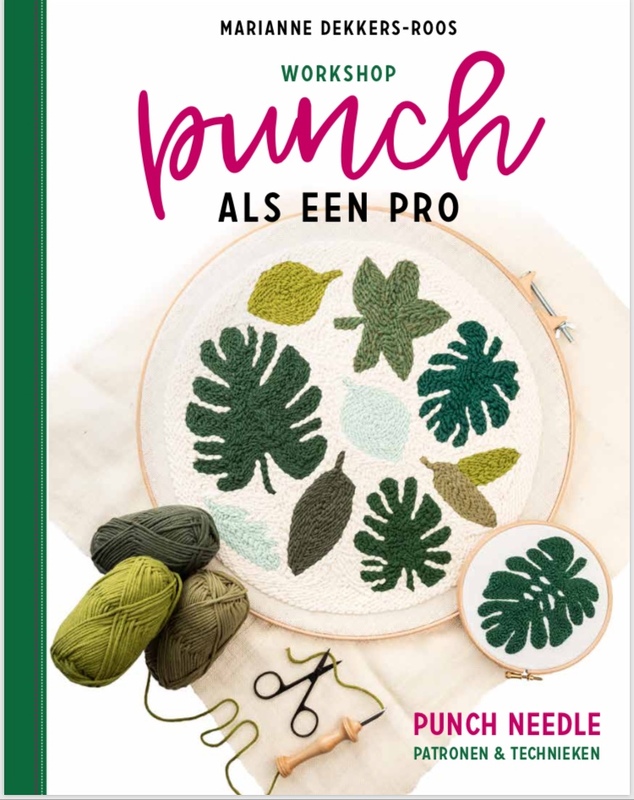 En jouw trui wordt zooo mooi; wie weet waag ik me daar ook nog eens aan ;-)!